Emilie Mediz-Pelikan (1861–1908), View of Lacroma (1902), oil on canvas, 80 x 90 cm, location not known. Wikimedia Commons. 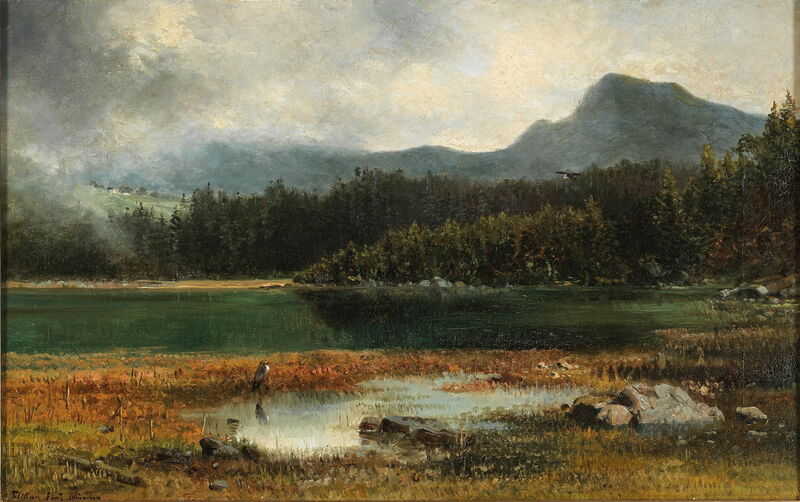 Some landscape artists created truly wonderful paintings which have now been all but forgotten. Today, I will look at the few works that I can find by the Austrian Emilie Mediz-Pelikan (1861–1908). 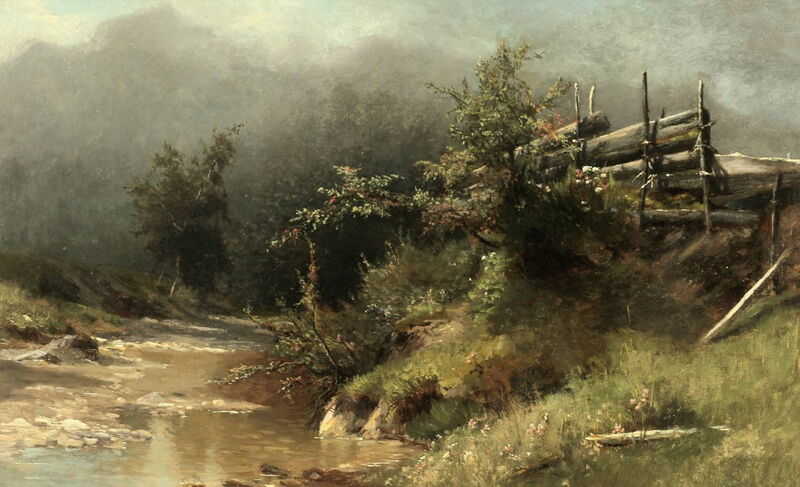 Tomorrow I will look at a slightly earlier landscape painter from Austria, Theodor Hörmann von Hörbach, and on Friday at Fritz von Uhde, who was once known as Germany’s leading Impressionist. Emilie Pelikan was born in Upper Austria in 1862, and went to assist and then be taught by Albert Zimmermann in Salzburg. When he went to Munich in the 1880s, she accompanied him, but he died there in 1888. Emilie Mediz-Pelikan (1861–1908), Wooded Bank by the Brook (Brannenburg) (1886), oil on cardboard, 38.7 x 63 cm, location not known. Wikimedia Commons. Emilie Mediz-Pelikan (1861–1908), Heron at the Wooded Bergsee (date not known), oil on canvas, 37 x 59 cm, location not known. Wikimedia Commons. After Zimmermann’s death, Pelikan lived in the artists’ colony at Dachau, when it was a small country town (long before the Nazis built a concentration camp there), and around 1890 moved to Paris, from where she went to another colony on the North Sea coast, in the Belgian town of Knokke. Her first solo exhibition in 1890 met with a favourable critical reception, but little impact on her career. Emilie Mediz-Pelikan (1861–1908), Sea Buckthorn (Knokke, Belgium) (1890), oil on canvas, 60.5 x 48 cm, location not known. Wikimedia Commons. Some of her paintings became higher in chroma following her exposure to Impressionism in France. 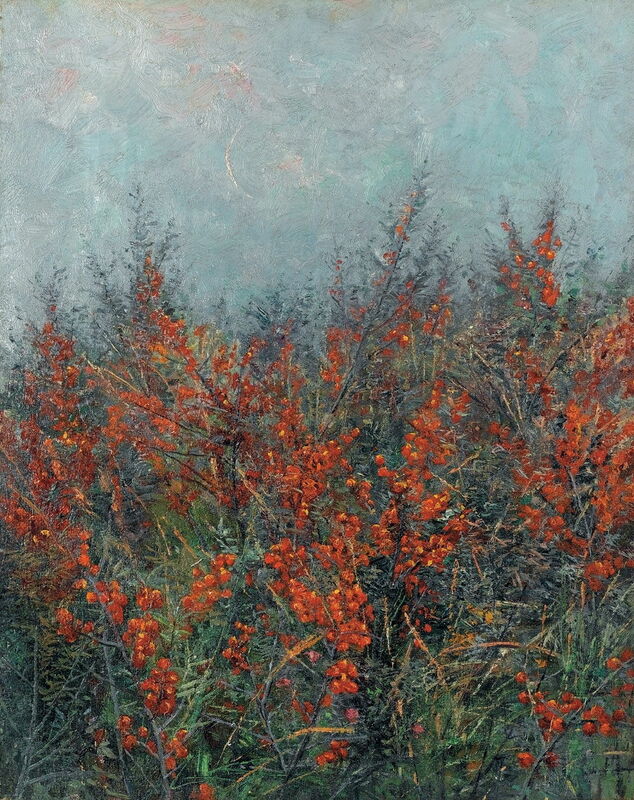 She painted this clump of Sea Buckthorn at Knokke in Belgium in 1890. Emilie Mediz-Pelikan (1861–1908), Dune Landscape in the Evening (Knokke) (1890), oil on panel, 35.5 x 26 cm, location not known. Wikimedia Commons. 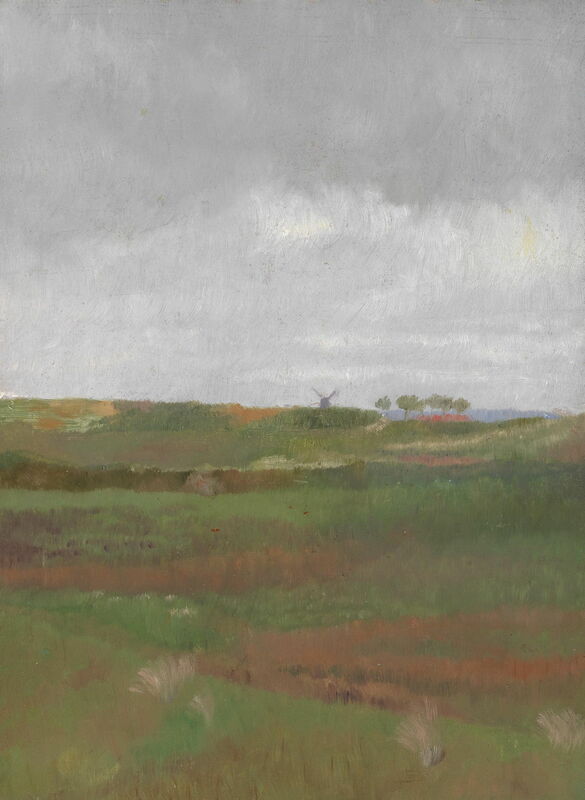 Her broader landscapes, though, were looser and more muted, such as this Dune Landscape in the Evening, also painted at Knokke in 1890. 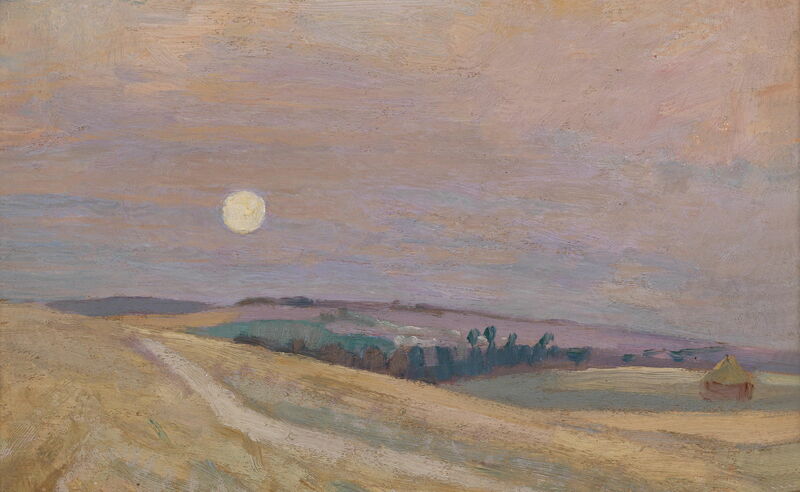 Emilie Mediz-Pelikan (1861–1908), Sunset (date not known), oil on panel, 14.7 x 23.5 cm, location not known. Wikimedia Commons. Although undated, I suspect that this Sunset was painted at about this time, and shows her extending into less conventional colours. In 1891, she married the painter Karl Mediz, becoming Emilie Mediz-Pelikan. They tried to establish themselves in Vienna, then moved to Krems an der Donau in (northern) Lower Austria, on the river Danube. They finally settled in Dresden in 1894, travelling to the Tyrol, Italy and the Mediterranean coast to paint there when they could. Emilie Mediz-Pelikan (1861–1908), Gschloß (Castle) (1899), pastel on paper, 45 x 58 cm, Private collection. The Athenaeum. 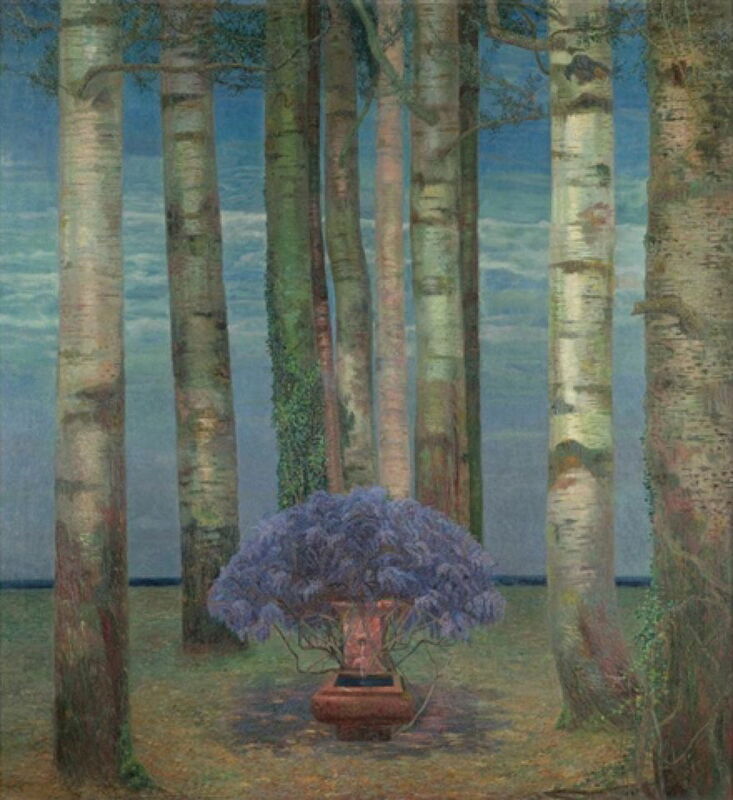 Emilie Mediz-Pelikan (1861–1908), Flowering Chestnuts (1900), oil on canvas, 132 x 184 cm, Österreichische Galerie Belvedere, Vienna, Austria. Wikimedia Commons. 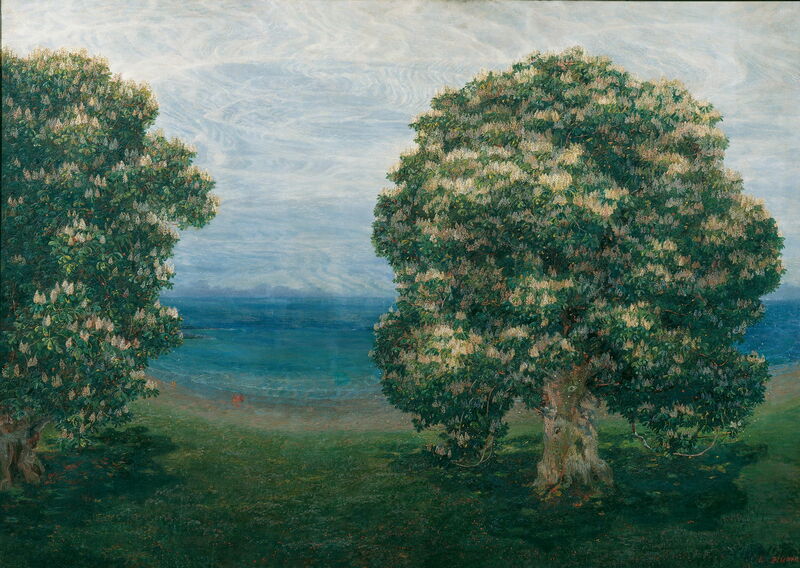 Flowering Chestnuts from 1900 is now perhaps her best-known, or least-forgotten, painting, with its contrasting rhythm in the flowers and the fine whorls of the clouds. Two small groups of people at the water’s edge provide subtle colour contrast. Emilie Mediz-Pelikan (1861–1908), View from the Dürnstein Ruins over the Danube Valley (c 1900), oil on paper, 34 x 50 cm, location not known. Wikimedia Commons. 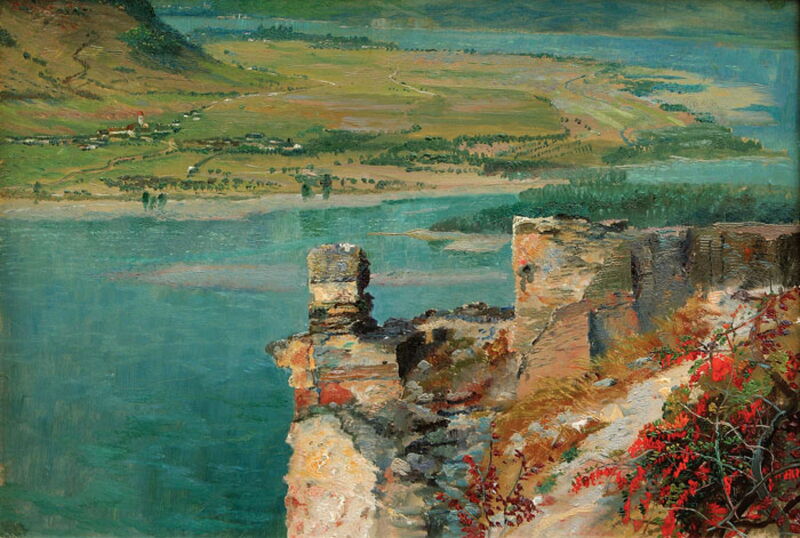 She painted this View from the Dürnstein Ruins over the Danube Valley in about 1900 too. In the foreground are the ruins of Dürnstein Castle, near Krems, with the River Danube below, meandering tightly from the top. The castle was built in the early twelfth century, and King Richard I of England was held prisoner there in 1192-93. It was abandoned in 1679. Mediz-Pelikan’s breakthrough finally came with two exhibitions around the turn of the century: the first exhibition of the Vienna Secession in 1898, where she and her husband showed three works, and at an international exhibition in Dresden in 1901. 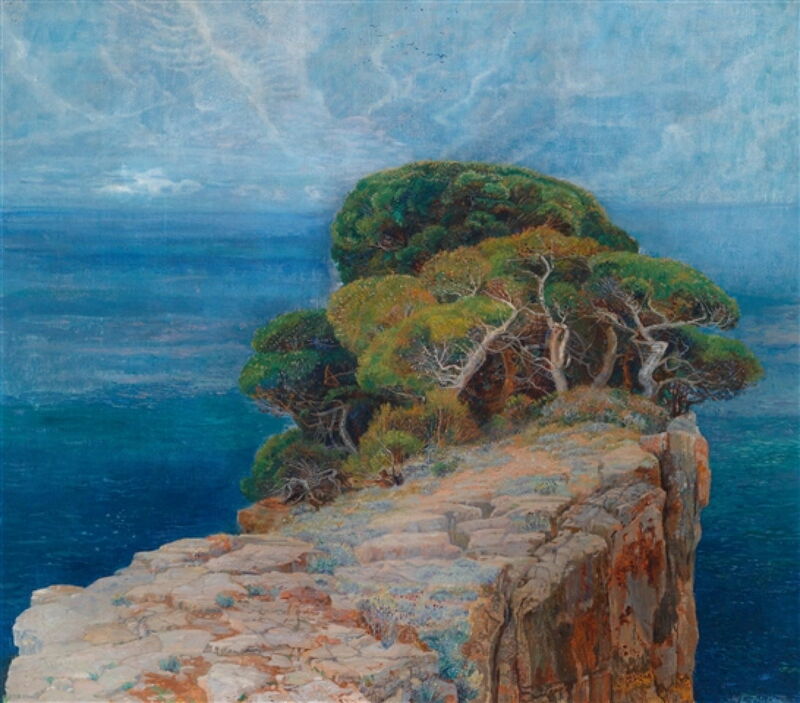 This unusual View of Lacroma from 1902 was perhaps painted on a rock promontory of the island of Lokrum, just off Dubrovnik in Croatia. Its supernatural appearance suggests the development of symbolism in her work. 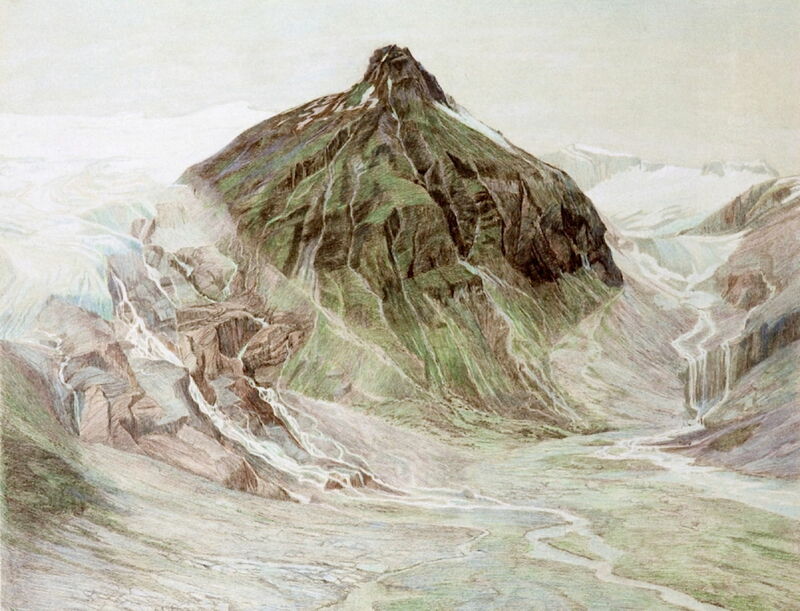 Emilie Mediz-Pelikan (1861–1908), Berchtesgaden (1903), pastel on paper, 36.2 x 54.5 cm, Private collection. The Athenaeum. 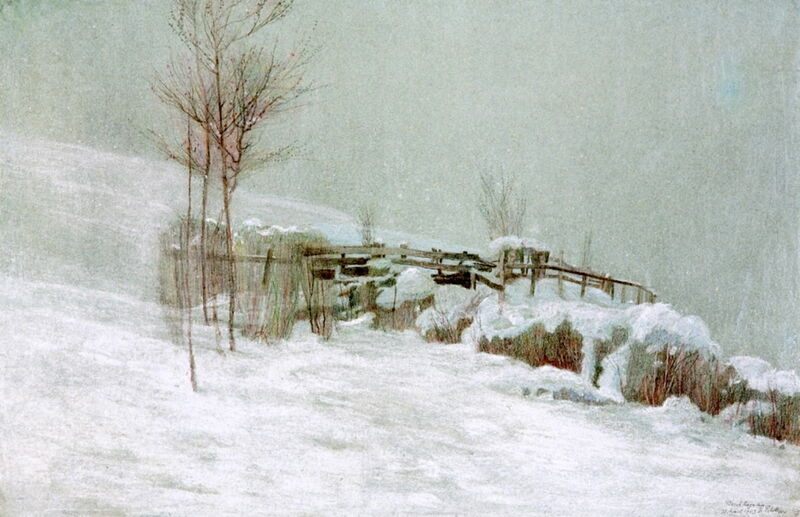 She painted this wintry scene at Berchtesgaden in 1903 using pastels, an unusual choice of medium for a snowscape with such fine detail. I have images of three paintings of hers for which I am unable to even suggest a date, although I suspect that they were completed after 1890. Emilie Mediz-Pelikan (1861–1908), Wisteria, Fountain and Poplar Trees (date not known), oil on canvas, 160 x 148 cm, location not known. Wikimedia Commons. Wisteria, Fountain and Poplar Trees has a definite look of symbolism, with its ghostly purple wisteria bush, water fountain, and clump of poplar trunks. Emilie Mediz-Pelikan (1861–1908), At the Park Wall (date not known), oil on panel, 24 x 18.5 cm, location not known. Wikimedia Commons. 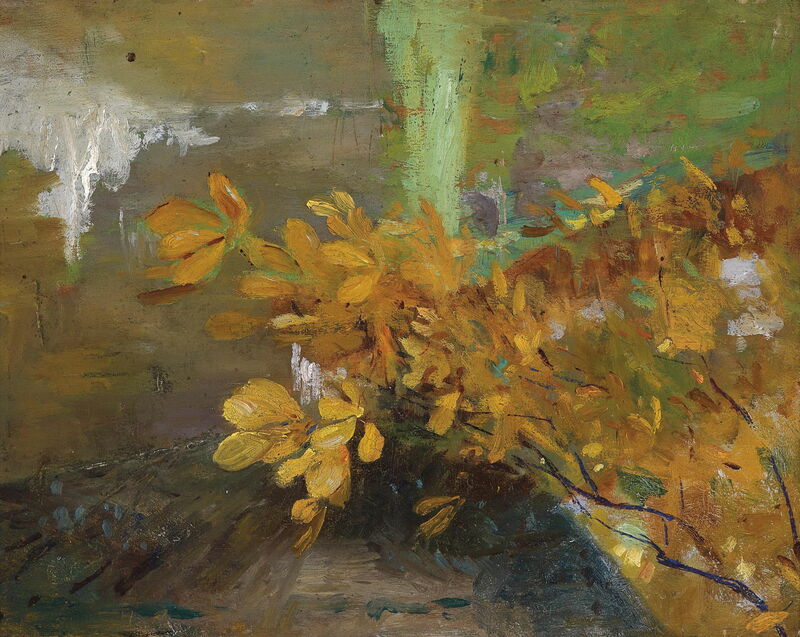 At the Park Wall appears to be a quick oil sketch of some autumn vegetation, which could perhaps date from earlier, when she was in France or Belgium around 1890. 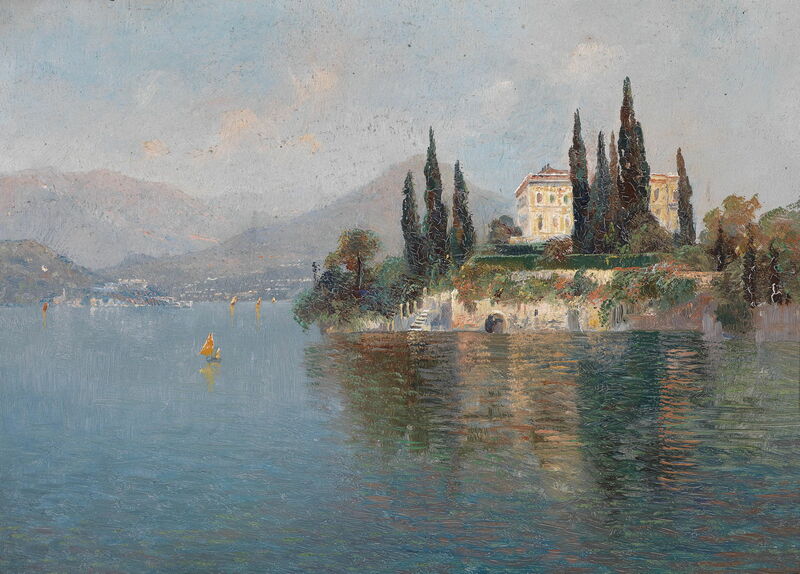 Emilie Mediz-Pelikan (attr) (1861–1908), View of Villa Cipressi, Varenna, Lake Como (date not known), oil on cardboard, 17.5 x 24 cm, location not known. Wikimedia Commons. View of Villa Cipressi, Varenna, Lake Como has been attributed to her, and was perhaps painted in more Impressionist style when she and her husband travelled to Italy together. In March 1908, when in Dresden, Emilie Mediz-Pelikan died suddenly from heart failure, at the age of only 47. Most of her work fell into the hands of a single heir, who refused any exhibition of it, and after their death those paintings passed to the East German state, where many seemingly vanished. Her work is finally, more than a century after her death, being rediscovered. Posted in General, Life, Painting and tagged Impressionism, landscape, Mediz, Mediz-Pelikan, painting, Secession, symbolism, Zimmermann. Bookmark the permalink. Wow, the article, the whole website. Clear, colorful, understated. I admire it greatly.